I have tried to involve my son L in my cooking whenever I can, and as a result, I have a two year old who absolutely loves to cook. In fact, sometimes he takes over and it's hard to get my whisk back without causing a very enthusiastic, foot-stamping, tantrum. Today was one of those days. 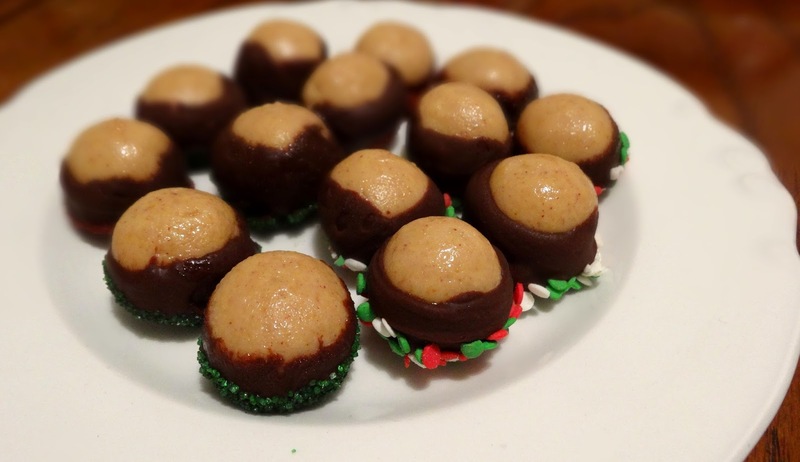 I decided to make buckeyes, and while they're technically more of a candy than a cookie, they are absolutely delicious and definitely deserve a place on your Christmas cookie plate. We fell in love with them while we were living in Ohio right after we got married. And really, who wouldn't love their creamy, velvety, peanut buttery center and the dark-chocolatey exterior? Seriously. The fact that they're so easy to make just makes them that much better. Anyway, L was helping me mix up the dough when Patrick started fussing across the room. L's usually pretty good about asking before he takes a taste of whatever we're making, so I wasn't too worried about leaving him alone on the stool for two seconds. Well, I forgot that peanut butter is pretty much his favorite food, and I turned around in time to see him cramming a fist full of peanut buttery goodness into his mouth! While I was able to rescue the dough before he went back for seconds, it resulted in quite the tantrum. Ah well, at least we know these cookies are toddler approved! And note to self: don't even look away for a second when cooking with L and peanut butter! In a large mixing bowl, beat together peanut butter, butter, and vanilla until well combined. With mixer on low speed, mix in the powdered sugar. In a double boiler, or heat-proof bowl set above boiling water, melt the chocolate and butter. Dip the peanut butter balls in the chocolate, being sure to leave some exposed at the top. (That way they look like a real buckeye.) Dip the bottom in sprinkles/colored sugar and set back on parchment lined baking sheet. Chill until chocolate is set. Work quickly while dipping - any amount of moisture keeps the chocolate from adhering properly. In fact, I divided the balls onto small plates and only worked with one at a time, and this worked really well. Makes about 5 dozen bite sized buckeyes.